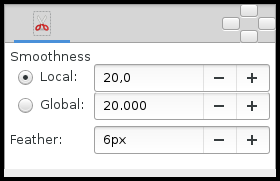 The "Cutout Tool" is designed to select a piece of the composition by adding a mask. Local : Adjust the Spline between the Splines points. Global : Adjust the Spline Globally. Feather : Width of the area that is going to be dissolved at the edge of the mask. This page was last modified on 7 March 2016, at 19:07.